Want to promote your roofing and restoration service or roof painting service online? We have the best converting, modern and visually appealing roofing and restoration landing page which you can use to promote your roofing services online at a very minimal price. 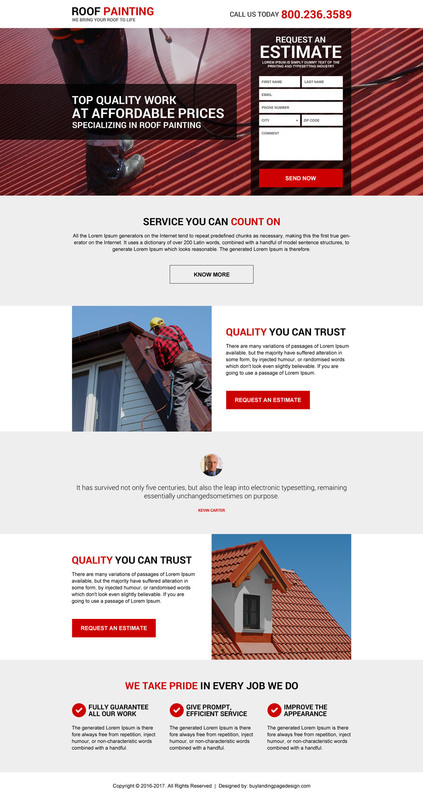 Use our responsive roofing landing page design to promote your business on mobile, smartphone, tablet, laptop as well as desktop and get exposed to huge traffic and potential clients. Roof painting request an estimated lead capture form landing page design with a strong call to action buttons throughout the landing page. You can capture phone call leads as well as email leads by using this visually appealing, clean and modern roof painting service landing page design.